You may have noticed that some intersection markings, including pedestrian crossings, are changing. Solid white lines are becoming dashed white lines. Ditto turning lines at intersections. This change brings Victorian practice into line with the Australian standard. NSW (and probably other states) used to have solid lines too, but sometime in the last few decades have switched to dashed. The corner of George and Liverpool Street, Sydney viewed from the first floor of the Centrury Hotel in 1980 and in 2017. Until recently, Victoria was the only jurisdiction to still use solid lines, but started switching in November 2015. 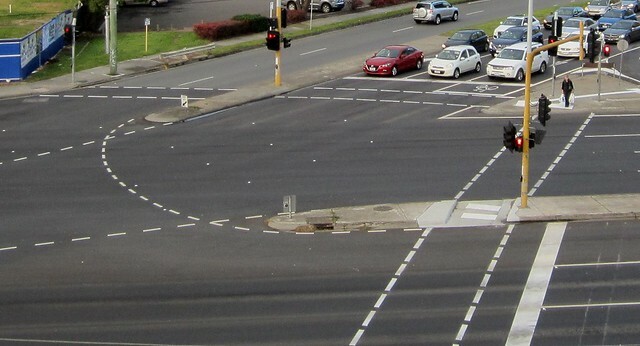 This Vicroads page (since removed, but still available via the Web archive) explains it all. It says they won’t go around and convert them all, but new lines will be in the new style, so it’ll be a gradual transition. And it says that when they restoring/repainting part of a solid line (or a set of two solid lines), it’s meant to stay solid. I’ve seen numerous locations where this isn’t the case; whoever has done it has left one solid, one dashed line, or lines that are part solid, part dashed. I can see how it’d make sense to move to the national standard. Other changes over time have been more significant. It used to be that right hand turning vehicles had priority over left turners. This change will mean the crossing looks different from the stop line. It may prevent confused motorists turning and stopping at intersection exits where they see a red light and (currently) a solid line. And one might fantasise that somehow possibly it might also improve motorist compliance at pedestrian crossings, to kerb the relentless and unchecked practice of vehicles blocking pedestrians. Though somehow I doubt it. The broken turning lane lines across intersections are very hard to see once they begin to wear. Some around Sydney only have one or two dashes left, the rest having worn off. I always preferred Victoria’s solid lines. I have a feeling the aim of all this is to save money on paint. Well now that they’ve eliminated any road rule requirement to follow the lines when turning, there’s no regulatory purpose for the lines remaining visible. Sure there’s still a safety reason, but these are lawmakers. Personally, if I’d been on that Standards committee I would have argued for solid turning lines and dashed pedestrian crosswalk lines, to achieve the purpose of further differentiating the crosswalk lines from the stop lines in the eyes of less observant motorists, and to ensure that the turning lines remain as visible as possible. I think dashed lines for pedestrian crossings will set a contrast from actual stop lines. Now I am hoping drivers will actually stop accordingly. Dashed lines seem less imposing than solid lines and thus less suitable for pedestrian crossings as well as the above mentioned issue of dashed lines wearing out. It would be better to paint the middle of the crossings a colour (probably yellow, as bike lanes get green and bus lanes get red) to highlight the fact they are not for general road traffic. Greater enforcement of the ban on obstructing pedestrian crossing is much needed as well. It would be interesting to calculate the cost in civil servant time (meetings, preparation of reports, approvals at various levels, changes to specifications, contracts, training and instructing the painters) to make this change. That’s before they start actually painting the road (*). Then consider that this change would have no effect whatsoever on anything. A dashed line is no safer than a solid line. No-one from interstate is going to get confused by a solid line rather than a dashed line. Consistency is a wonderful thing, but really, but did VicRoads even think about whether there was any cost-benefit to this effort? (*) Actually, I wouldn’t be at all surprised if dashed lines were *more* expensive to apply than solid lines. Interesting that the VicRoads’ webpage only gave one reason for changing to a dashed line – to be consistent with other states (or “the standard”). It doesn’t say what the advantages are of dashed over solid. Dashed lines have appeared in the west to allow the 3-container semis to now legally change lanes in the middle of a right hand turn. Visibility of dashed lines is much poorer at night +/- wet weather. It”s all part of the Vicroads plan to make driving harder than ever. 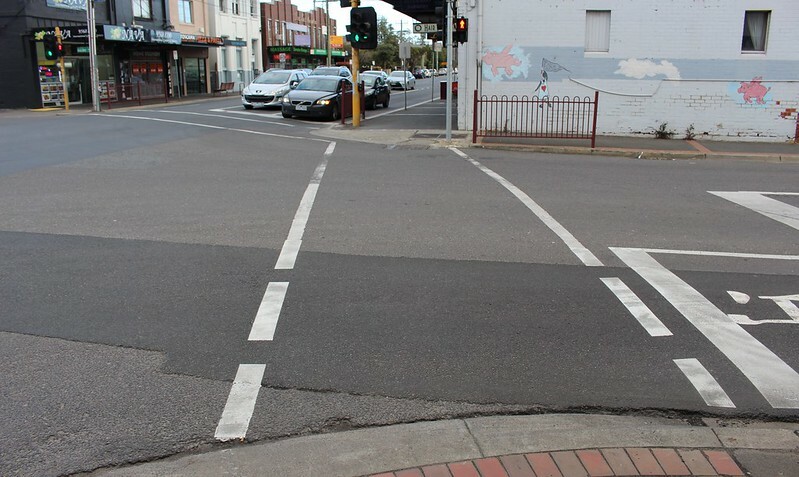 I have never noticed pedestrian crossing lines dashed like that in NSW. As a Melbournian who now lives pretty permanently in the UK I am worried reading “It used to be that right hand turning vehicles had priority over left turners”. If I hadn’t read it here I’d still be doing it (on my occasional visits). Just FYI, when did this come in and is there a Vic Roads reference? Rule 62 notes that at traffic lights, a vehicle must give way to: if the driver is turning right—any oncoming vehicle that is going straight ahead or turning left at the intersection (except a vehicle turning left using a slip lane). Late response, but I believe Philip’s comment is incorrect: You are required to follow the turn lines at intersections. See Rules 29 (left turn) and 33(2) (right turn).